Open from: 9.30 to 18.00 from Tuesday to Sunday. Last entrance is at 17.15. Th museum is closed on Mondays, 1 January and 25 December. The best time of day to visit is before 11.00 or after 15.00. The museum can be visited in any month. Avoid visiting during national holidays. We are comparing Musee National Picasso-Paris Skip the line Prices from leading ticket suppliers and Try to find you Cheap tickets prices on the market. The Spanish born artist and painter, Pablo Picasso was undoubtedly one of the most influential artists of the 20century. Best known for his innovative use of materials and unique brush strokes, Picasso paves the way for major art movements such as Dadaism and Futurism. Inside this 17-century mansion (which also houses the Hotel Sale) you will find one of the largest collections of Picasso’s works in the worlds. And, as this is a self-guided tour you’ll have all the time you need to admire his most famous and lesser-known masterpieces. Inside the gallery you can also find the works of Picasso’s favourite artists, including Degas, Cézanne, and Matisse. The museum also hosts temporary exhibitions and with your skip the line entrance ticket you’ll be able to visit these sections too. A must see for anyone interested lovers of art and fans of Picasso in particular. The museum contains an incredible collection of Picassos works including some originals. We recommend this museum for students and artists. Perfect if you want to save time by skipping long entrance lines, it will give you more time inside the museum. The venue is suitable for adults and children as well as disabled visitors. Your Experience With Musee National Picasso-Paris Skip the line? Get inside one of Paris’s finest buildings in the heart of the Marais neighbourhood. Save your vacation time with a priority entrance ticket which lets you skip the long queues to the Picasso Museum. Use your extra time to exploring the opulent rooms and grand galleries of this famous Parisian mansion. See an incredible collection of over 5,000 of Pablo Picasso’s artworks. Get inside the head of the world revered artist by taking a look at his private collection of paintings. 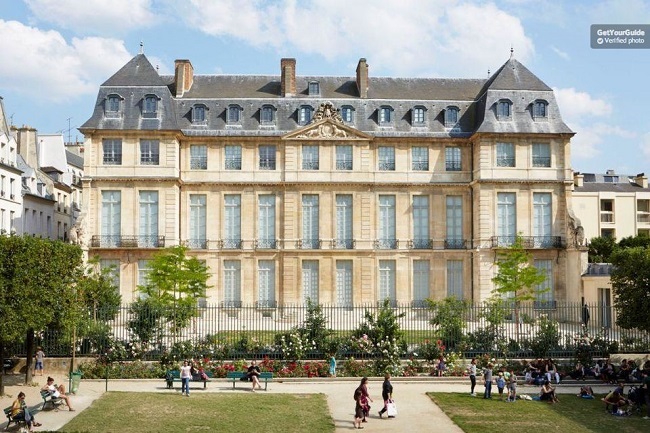 Get access to the permanent and temporary exhibitions at the Paris National Museum of Picasso. What Musee National Picasso-Paris Skip the line Includes? Fast-track skip the line entrance to the Picasso Museum. There are over 5,000 items on display inside this museum, therefore, we recommend arriving early so that you have until closing time to browse the exhibitions. Travelers Reviews about Musee National Picasso-Paris Skip the line? The Picasso Museum has been very highly rated by travellers who have reviewed the museum on TripAdvisor. Visitors have said that the museum hosts an impressive collection of Picasso’s works as well as an interesting exhibition of the artist's personal collections. The museum has earnt a 4 out of 5-star average rating from over 2,000 reviews on TripAdvisor. Similarly the skip the line self-guided visit has been given 4.5 out of 5 by Get Your Guide users and a full 5 out of 5-stars from travellers who reviewed the tour on Viator. The Picasso museum is wheelchair accessible. Tickets will be delivered via email. Please print your ticket or bring it to the entrance in electronic form. Cancellations policies depend on your individual tour provider, you may be able to cancel to a full or partial refund up to a certain number of days in advance however some ticket providers have a non-refundable ticket policy. Visitors under the age of 18 and EU citizens under the age of 26 can enter free of charge (a valid ID must be shown). The museum is free for everyone on the first Sunday of each month. Please do not bring any large bags or cases, there will be a short security check at the entrance and large bags can cause delays. Meeting Point: go directly to the entrance of the Picasso Museum. Address: 5 Rue de Thorigny, 75003 Paris. Bus: the museum can be reached using lines 20, 29, 65, 69, 75, or 96.